The artist and video maker Chris E. Vargas wants people to question what they know about the Stonewall uprising of 28 June, 1969, when the clientele of a Greenwich Village bar fought back against a police raid in a melee that ultimately drew hundreds of people. For starters, he contends that many of the activists who took part in that watershed moment in the gay liberation and LGBTQI movement have not been given proper credit, including the transgender pioneers Sylvia Rivera, Marsha P. Johnson and Miss Major. To help remedy that, he and the New Museum invited 12 artists to reflect on that history by proposing new Stonewall monuments for Christopher Park, where the rioting spread that steamy night in 1969. The results are now on view at the New York museum in MOTHA & Chris E. Vargas: Consciousness Razing—The Stonewall Re-Memorialization Project (until 3 February 2019), an exhibition and artist’s residency hosting Vargas and his Museum of Transgender Hirstory & Art, a semi-fictional nomadic institution that serves as a platform for visually exploring trans history. 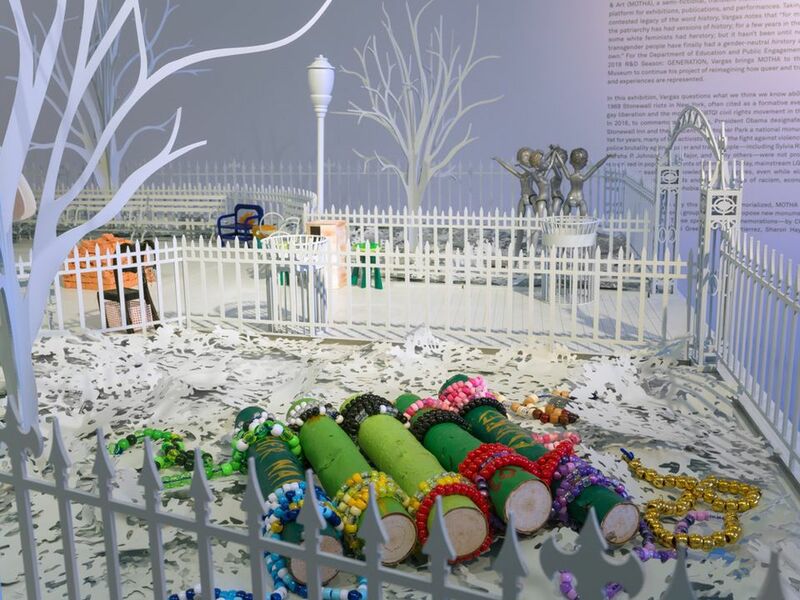 The show includes artist statements, maquettes of the proposed monuments and a scale model of Christopher Park through which the maquettes rotate. There are also a few artefacts from the Stonewall uprising itself. The proposals vary significantly in style. Chris Bogia suggested a 26-foot-long shape of the Stonewall Inn’s façade, tilting up in the air and supplemented by colourful forms like a high heel, a fist, a painted finger and a billy club. Martine Gutierrez created a sculptural silhouette of four ambiguously gendered polished metal figures intersecting at the hip, while Nicki Green contributed a stack of 200 bricks representing bar-goers the night of the raid. Keijaun Thomas presents five wooden logs, each representing an activist constituency, connected by hair beads. Sharon Hayes suggests a 1969 Pacific Bonneville station wagon with a public address system mounted on top that would drive around the country hosting readings and speeches that reflect on Stonewall. D’hana Perry proposed a triad of circles onto which stylised video images of transgender “sheroes” are projected, and Devin N. Morris submitted an assemblage of furniture that comprises “seats for all black trans women weary from societal abuses”. According to Sara O’Keeffe, one of the show’s curators, most of the artists in the exhibition share a determination to highlight “folks who have been sidelined in the way the story of Stonewall has been told but who were really at the forefront of pushing for equality and liberation and support”, including trans activists. “They’re also thinking about how we create structures that do not criminalise queer and trans people, even today,” she says. In an interview circulated by the New Museum, Vargas says that the role of radical politics in the Stonewall uprising has been underplayed and he hopes the exhibition will help correct that. Yet “while I am trying to destabilise and question what we actually know, I also want to emphasise the importance of the unknowable, too—the things that we can’t possibly know about what happened there because some voices have been lost to history,” he says. In 2016 the Stonewall Inn, Christopher Park and the surrounding streets and sidewalks that were the site of the 1969 uprising were designated a national monument by President Barack Obama.